Soon Launch Complex 39A will be certified for launching the Falcon-9 and Falcon Heavy. The viewing locations remain the same, the line-of-sight distances are changing. This updated Google Earth map will help with your decision to view these exciting launches. Up next for SpaceX (Space Exploration Technologies) are the Echostar 23 and CRS-10 missions. Tentatively scheduled for early February. Sunday, June 28, 2015, at 10:21 am EDT SpaceX, will launch a Cargo Resupply Mission (CRS-7) to the International Space Station. Over 5,500 pounds of supplies, equipment and experiments will be packed into the Dragon capsule mounted atop the Falcon 9 rocket, propelled in two stages. Nine (9) Merlin 1-D engines will power the spacecraft off the pad and the second stage powered by One (1) Merlin 1-D Vacuum will push it higher. As of today, June 25th according to the 45th Space Wing of the United States Air Force, the weather is a 90% go! 1. Port Canaveral – HWY 401 from SR 528 (Beachline) at Cruise Terminal 5/6. Roadside parking is limited. This is the closest direct-line view to Launch Complex 40. This one is the closest and offers a view of the T-0 ignition. Approximately 8.5 miles from the pad. 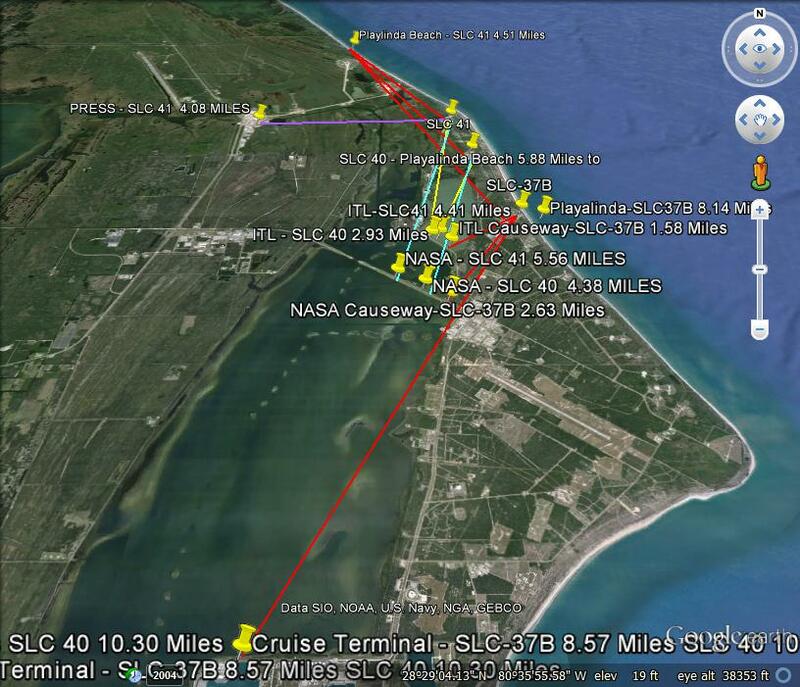 All other locations on this map are from within KSC and CCAFS. 2. SR 528 (Beachline) On the westbound side just after the exit for Hwy 401 is a great location. Plenty of parking and a veteran broadcaster sets up his RV and broadcasts the launch. Memorabilia and lot’s of discussion and experience out here. 3. Several areas along US 1 in Titusville, including Kennedy Point Park, Space View Park and under Max Brewer Memorial Causeway (next to Crackerjacks Seafood and Tiki Bar). 4. Merritt Island National Wildlife Refuge at Playalinda Beach. Park at Lot1 and walk south approximately 1 mile to the border fence of CCAFS/KSC. There is a charge to enter the park. 5. Old Florida Grill and Oyster House – US1 in Sharps. Deck and pier overlooking the Indian River. 6. You can purchase a launch viewing ticket in addition to your regular ticket at the Kennedy Space Center Visitor Complex. You will be bused out to a very nice viewing location. The roar of the Falcon 9 can be heard from miles away….front row seats are just better. Claim yours! June 25, 2015 in Uncategorized. ← Port Canaveral: On Its Way To Compete In The Global Marketplace! Is Gulftainer USA Heading Out To Sea From Port Canaveral? That kinda day! An Arnold Palmer.